I was heading out of town to catch up with part of my family in Detroit - we were catching the Christmas Spectacular Rockettes show. This was my first time seeing the show and there were some unfortunate technical difficulties, so the double decker bus and the cab scene were cut. But it was still a fabulous show. The best part might have been watching it with my nieces and nephews. We danced in our seats and laughed and gig gled- it was amazing! While I was out frolicking in the holiday spirit- Dave was left at home alone. I wanted to leave him some good food that he could just heat up. Being the cheese lover he is, anything with cheese would do. We settled on a Mac and Cheese that he could pop into the oven. 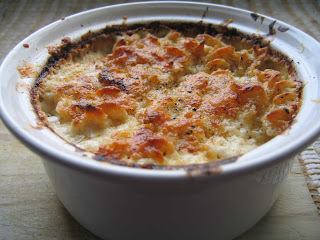 There's a million mac and cheese recipes and I make it different every time I make it. 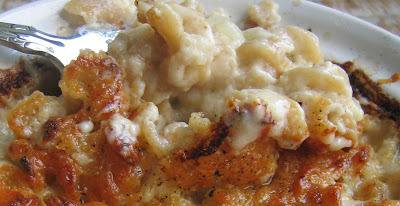 (try my goat cheese mac and cheese some time!) This time I had some buttermilk that was nearing expiration, so I used that along with the rest of the leftover milk products in the fridge. I love the slightly tangy sourness this added and this is now one of my favorite recipes-be forewarned that this is real rich! Again I had not written this down until weeks later-but I'm fairly sure this is close to the right measurements. Give it a try and let me know how it worked out for you. Dave loved it and was able to just reheat it while I was partying with the fam'. You'll love this version too! It should be real sauce to accommodate for the oven baking. Feel free to add to this- I added chorizo to the left overs and it was amazing! This is a huge recipe, you may want to cut it in half. In the meantime, cook 1 box (around 8-10 cups of uncooked pasta) of rotini pasta (use what ever past you like) according to directions, but leave this slightly al dente, since this will go into the oven to cook further. 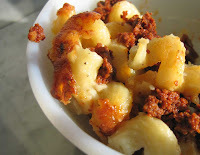 Combine the pasta and sauce, pour into a large oven proof dish or individual dishes. 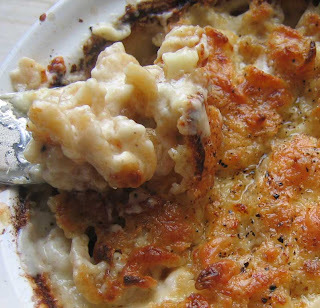 Don't worry if the cheese chunks are not all melted- they will melt in the oven. Top with shredded white cheddar, Parmesan cheese and black pepper. Bake at 350 until the top is crusty and the sauce is bubbly.